What are Termidor and Taurus? Termites beware…Termidor and Taurus are the number one termite killers in the country. What is Fipronil and the Transfer Effect? The key ingredient of both Termidor and Taurus is Fipronil: one of the most powerful insecticides on the market. This product has been used for over 20 years to control common pests like rats, fleas, roaches, and of course, termites. Fipronil kills termite colonies via the Transfer Effect. Since termites are social creatures, when they come in contact with the product, they do not die immediately. Instead, they have time to contact, and feed, many other colony members and transfer the product, so the whole colony can be eliminated. While this process does not occur overnight, it is the best way to ensure efficient total termite colony elimination. How does the Transfer Effect work? Termidor and Taurus utilize an advanced, undetectable liquid technology that termites cannot see, taste or smell. Since they cannot avoid it upon contact, termites ingest and share the product with the rest of their colony. Most other termiticide products will cause the termites to die quickly, but they won’t transfer termiticide to other colony members, leaving the colony intact. Most colonies will be eliminated in 30 to 90 days with Termidor or Taurus liquid treatments. It can vary depending upon colony size, moisture conditions, and infestation levels. 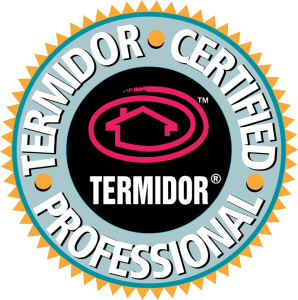 Termidor alone has protected over four million homes in the U.S. since being introduced in 2000, and have most likely killed just as many termites. (But, who’s counting anyway?) Taurus is the newest Fipronil based product on the market for termite control and is quickly catching up. How can Termidor or Taurus be applied? Both products are most commonly applied as a liquid around the foundation of the home or structure. They can also be applied as a foam formulation or a dust formulation for special infestations and circumstances.